Fort Irwin hosts two job fairs each year, giving Soldiers, family members and veterans a chance to meet face-to-face with employers. There were 34 employers present at the job fair on Oct. 19. 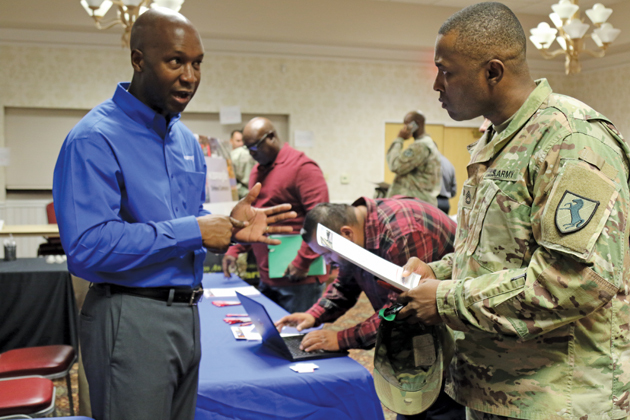 FORT IRWIN, Calif. — Representatives of 34 different employers met with veterans, military spouses and other Fort Irwin community members during the job fair hosted by Army Community Services on Oct. 19 at the Samuel Adams Ballroom. The biannual event gives jobseekers a chance to explore the breadth of opportunities available regionally and on-post, and it provides employers with access to high-quality candidates. Brent Garcia, of the Las Vegas Metropolitan Police Department, echoed that sentiment. 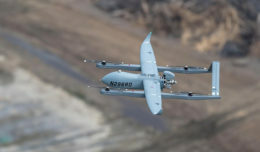 He noted that his organization has a much higher rate of success recruiting from military bases. Applicants associated with the military are less likely to fail stringent background checks and are used to the structured discipline necessary to thrive in the police force, he said. The job fair also offers a unique venue for employers and prospective applicants to talk and ask questions in person. Heidi Allen agreed. A military spouse for six years, Allen recently moved to Fort Irwin from Korea and attended the job fair to get a sense of the employment market here. “USA Jobs is great, but it can be a bit cold and it’s nice to see what the jobs are really looking for,” she said, referring to the federal government’s online employment information system. Allen added that she appreciated the job fair’s focus on employers that actually have job openings available. 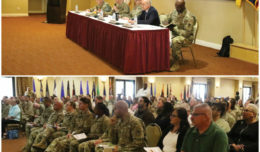 The job fair is tailored for Soldiers who are considering a transition to the civilian workforce, as well as residents of Fort Irwin who are looking for jobs on post. The employers present at the event ranged from medical providers to linguists, law enforcement to retail. The variety underscored a key point that Moreno often makes to new jobseekers: just because Fort Irwin is remote doesn’t mean that it lacks employment opportunities. Moreno publishes a list of available jobs every two weeks, and it nearly always includes roughly 250 positions, she said. She encourages prospective jobseekers to keep an open mind. Even if a certain employer focuses on retail, for example, there are often a range of other positions available in human resources, finance and other general business departments, she said. Fort Irwin’s Employment Readiness Program regularly offers classes on crucial job search skills, including career planning, resume writing, interviewing and salary negotiation. Individuals can also schedule one-on-one sessions for personal assistance. 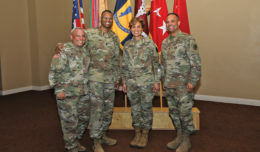 More information about the program can be found at https://irwin.armymwr.com/programs/employment-readiness.